HP Umpire Mike Everitt ejected Tigers DH Victor Martinez for arguing a strike one call in the bottom of the 3rd, Tigers Hitting Coach Wally Joyner and Manager Brad Ausmus for arguing a strike three call in the bottom of the 5th, and Tigers RF JD Martinez for arguing a strike three call in the bottom of the 6th inning of the Angels-Tigers game. In the 3rd, with two out and none on, Martinez took a 0-0 fastball from Angels pitcher Brett Oberholtzer for a called first strike. Replays indicate the pitch was located over the inner half of home plate and knee high (px -.436, pz 1.580 [sz_bot 1.540]), the call was correct. In the 5th, with none out and none on, Tigers batter Ian Kinsler took a 2-2 slider from Angels pitcher Jhoulys Chacin for a called third strike. Replays indicate the pitch was located over the heart of home plate and below the hollow of the knee (px .096, pz 1.365 [sz_bot 1.510 / MOE 1.427]), the call was incorrect. In the 6th, with none out and one on, Martinez took a 1-2 fastball from Angels pitcher Chacin. Replays indicate the pitch was located over the inner half home plate and and at the hollow of the knee (px -.603, pz 1.611 [sz_bot 1.690 / MOE 1.607]), the call was correct. At the time of all four ejections, the Angels were leading, 3-1. The Angels ultimately won the contest, 3-2. 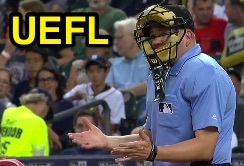 This is Mike Everitt (57)'s third, fourth, fifth, sixth ejection of the 2016 MLB regular season. Mike Everitt now has 14 points in UEFL Standings (10 Prev + 4*[2 MLB] + 2*[2 QOCY] - 2*[4 QOCN] = 14). Crew Chief Mike Everitt now has 14 points in Crew Division (12 Prev + 2 Correct Calls + 0 QOCN = 14). This is the 142nd, 143rd, 144th, 145th ejection report of the 2016 regular season. This is the 68th, 69th player ejection of 2016. Prior, to ejection the Martinezes were 1-1 & 1-3 in the contest. This is 56th Manager ejection of 2016. This is Detroit's 7-10th ejection of 2016, 1st in the AL Central (DET 10; CWS 7; MIN 6; CLE, KC 5). This is Victor Martinez's first ejection since July 11, 2015 (Marty Foster; QOC = N [Balls/Strikes]). This is Wally Joyner's first ejection since May 21, 2008 (Jim Reynolds; QOC = U [Balls/Strikes]). This is Brad Ausmus' 3rd ejection of 2016, 1st since May 16 (Doug Eddings; QOC = N [Balls/Strikes]). This is JD Martinez's first career MLB ejection. This is Mike Everitt's first ejection since June 30, 2016 (Mike Matheny; QOC = Y [Replay Review]). Wrap: Los Angeles Angels vs. Detroit Tigers, 8/27/16 | Video available via "Read more"